One of the Federal Reserve’s favourite indicators for measuring the labour market is the Labour Market Conditions Index, or LMCI. This composite index tracks 19 data points and combines them into one score that seeks to measure the relative health of the US labour market. The figure has been used for everything from economist’s predictions of recession to a US Senator’s questioning of Federal Reserve Chair Janet Yellen. And given this measure’s prominent status, it’s important for the Fed to keep close tabs on the inputs used to derive this measure. And in a blog post published Thursday, the Federal Reserve said some recent data looked a little bit odd and traced this back to one somewhat unlikely place: Craigslist. One of the 19 components of the LMCI is what’s called the composite help-wanted index, which uses data gathered by the Conference Board to estimate how many businesses are looking to fill positions. One of the key elements of this sub-index is Help Wanted Online Data (HWOL), which draws heavily from job listings on Craigslist. The only problem: the number of Craigslist help wanted ads may be going down due to a recent price increase. And according to Fed economists Tomaz Cajner and David Ratner, this may be distorting the LMCI. However, over time Craigslist gradually moved away from the model of free online vacancies and began charging $25 for a job ad in many metropolitan areas. Moreover, at the end of 2015 Craigslist raised fees from $25 to $35 or $45 in selected metropolitan areas. All told, the average price for Craigslist job ads rose substantially, and roughly doubled since the end of 2012, coinciding with the period when online vacancy posting as measured by HWOL noticeably underperformed the JOLTS vacancy growth. Basically, the increase in price is causing a drop in people posting help wanted ads to Craigslist, which then feeds back through the data channels and could weigh down the LMCI data. 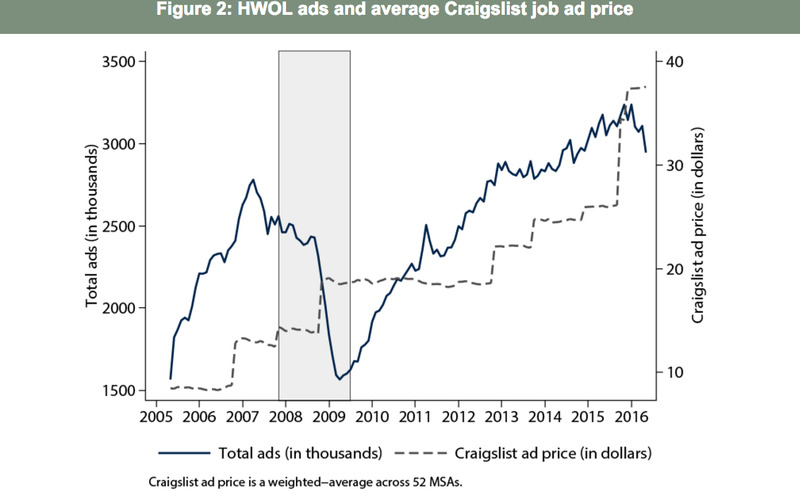 In order to determine the magnitude of the Craigslist increases, the researchers then went through different metros to track the drop in HWOL for those areas when the price of an ad increased from $0 to $25. They found that the increases can have a substantial impact on the data. 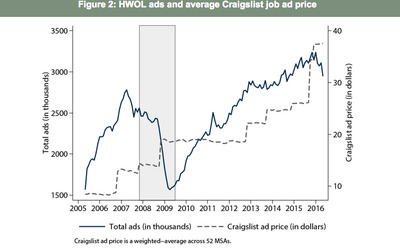 “Overall, Craigslist price increases can account for 12% lower level of total HWOL ads and 22% per cent lower level of new HWOL ads at the end of 2015,” write Cajner and Ratner. In May, the LMCI fell to -4.8, the worst reading in seven years. Which seems like a really bad sign for the US economy. Or maybe not.